Perhaps best known for Thanksgiving food — and the blood sugar spikes that can come with it — November may be the perfect time to raise awareness about diabetes. November is the National Diabetes Education Program's National Diabetes Month. A report from Emory University this November found that a major problem with diabetes is that it’s not being identified in about a third of people who have it. So millions of people who could be treating their diabetes and improving their health aren’t doing so. The American Diabetes Association (ADA) sponsors American Diabetes Month in November to help those people find out whether they have diabetes, how to avoid it and how to treat it. The number of people with diabetes in the US has been climbing every year. According to the National Diabetes Statistics Report, 2014, 9.3 percent of the US population had diabetes in 2012. That’s 29.1 million people — and a big jump from an estimated 18.8 million with the disease in 2010. There are several possible reasons behind the growing diabetes rate. The risk of getting the disease increases as people age, and the senior population has been swelling. Just over a quarter of Americans over the age of 65 have the condition, the ADA reports. Expanding waistlines may also play a role in the expanding number of diabetes cases. Diabetes risk climbs for those who are obese, and more than 1 in 3 US adults are considered to be obese, according to the National Health and Nutrition Examination Survey, 2009–2010. There are two types of diabetes. With type 1 diabetes, the body doesn’t produce insulin. Insulin is a hormone that regulates blood sugar. Type 1 is less common than type 2 diabetes. Only about 5 percent of those with diabetes have this type, the ADA says. It is usually diagnosed in children and young adults. 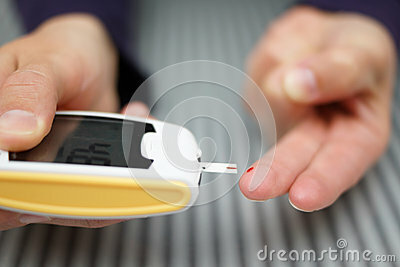 Type 2 diabetes is a condition in which the body produces insulin but doesn’t use it effectively. Type 1 can’t be prevented, but type 2 diabetes may be avoided through regular exercise, maintaining a healthy weight, and eating a healthy diet with plenty of fiber and whole grains. With untreated diabetes of either type, sugar can build up in the blood. If a person’s blood sugar stays at a high level because of untreated diabetes, it can damage the heart, blood vessels, eyes, kidneys, nerves and other parts of the body over time. Also, more and more people have been developing prediabetes. This is also a condition marked by high blood sugar — but not as high as with diabetes. The ADA reports that 86 million Americans age 20 and older had prediabetes in 2012— up from 79 million in 2010. If they catch prediabetes in its early stages, patients can take action to reverse their condition. Medication and lifestyle changes (such as diet and exercise) can control type 2 diabetes and prediabetes — and prevent them. Regular blood tests can determine whether a patient has prediabetes or diabetes. People who are older than 45, overweight, and not very physically active face a raised risk for prediabetes and type 2 diabetes. People who have family members with diabetes also run a higher risk. Women who had gestational diabetes (diabetes while pregnant) or gave birth to a baby who weighed more than 9 pounds may also be more likely to develop diabetes. Diabetes symptoms can be mild and go unnoticed, but the ADA says that common signs of the disease are urinating often, feeling very thirsty, feeling very hungry, extreme fatigue, blurry vision, cuts or bruises that are slow to heal and tingling, pain, or numbness in the hands or feet. Being aware of symptoms and risk factors may help patients recognize that they have the disease and seek treatment. During this National Diabetes Month, the National Diabetes Education Program is stressing the Diabetes ABCs. Managing the following factors can help lower the risk of heart disease and other health risks that diabetes patients are more likely to face. A is for A1C test. This blood test measures a patient’s average blood sugar level over the past three months. B is for blood pressure. This is the pressure that blood exerts against the blood vessel walls. Maintaining healthy blood pressure lowers heart disease risk. C is for cholesterol. Keeping "bad" cholesterol (LDL) low and "good" cholesterol (HDL) higher can promote healthy blood vessels. Too much bad cholesterol can lead to blocked arteries, which can cause a heart attack or stroke. S is for stop smoking. Smoking poses a huge risk to heart health. Diet, exercise, and medication are key for controlling diabetes and managing risk factors like high blood pressure and high cholesterol. Regular checkups with a doctor can be key in finding diabetes early and getting the treatment needed to lower the risk of heart disease and other health problems.